Setting up debugging in an IDE with a local PHP development environment has gotten so easy it can be done in a couple automated steps. In this post I will demonstrate how to get step debugging functioning with Zend Studio and Zend Debugger when the server is set up on a local environment. 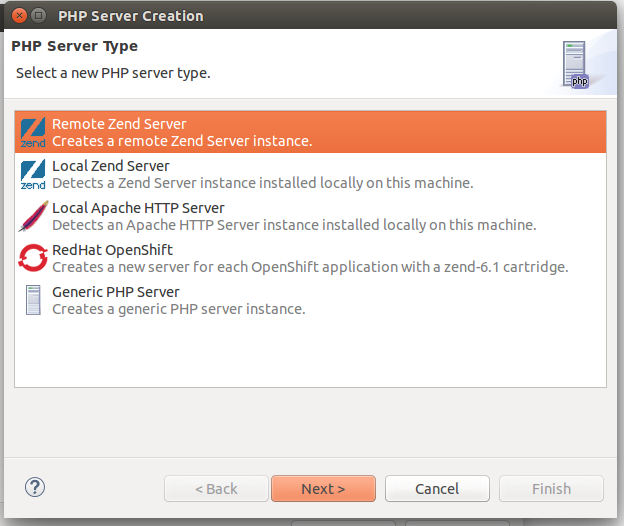 Local installation of Zend Server 8.5.+ (basic LAMP stack, but with Zend Debugger included in the Zend Server installation). Alternatively I could have had a vanilla LAMP environment with Xdebug. Ensure that Z-Ray is active in the Zend Server settings. 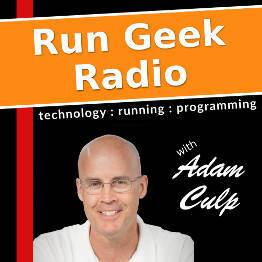 The local project set up as an Apache virtualhost. 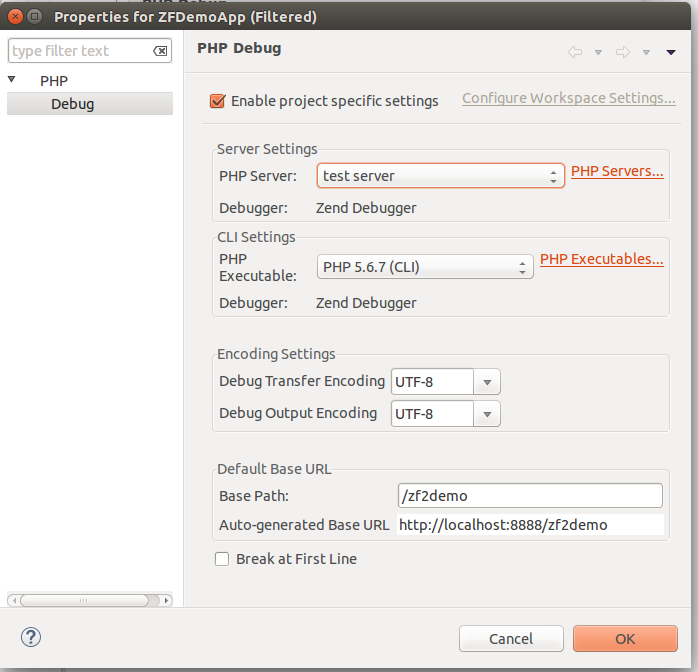 Ensure Zend Studio is running with the project we will debug open. In a browser with the application rendered I click the debug icon in the Z-Ray toolbar at the foot of the window, and select the desired debugging action. 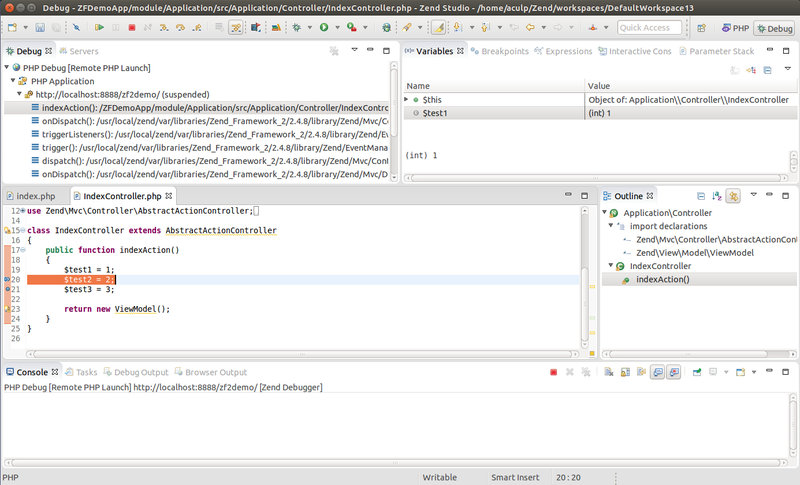 This will cause Zend Studio to prompt if we desire to use the Debug Perspective after it receives the debug connection from Zend Debugger. In most cases we can simply click Yes and let things happen normally. That’s about it, we are debugging! This was a very simplistic local development environment setup. We didn’t have a firewall to contend with, and the server was set up locally rather than inside a virtual machine. I have other posts, linked below, to help with some of these alternative setups. Setting up PHP debugging in an IDE with a local development environment has gotten so easy it can be done in a few automated steps. In this post I will demonstrate how to get step debugging functioning with PhpStorm and Zend Debugger when the server is set up on a local environment. Then a browser with the application rendered I click the debug icon in the Z-Ray toolbar at the foot of the window, and select the desired debugging action. This will cause PhpStorm to prompt after it receives the debug connection from Zend Debugger. In most cases we can simply click Accept and let things happen normally. Behind the scenes, PhpStorm created a site and associated it with the project. Of course we could have created the server ahead of time and not be prompted to Accept the incoming connection, but what is the fun in that? Recently I was helping someone set up step debugging of PHP in Zend Studio to debug a remote site, and had some difficulties. So I decided to create this post to remind me later, and perhaps help others get it set up. I was doing this on an Ubuntu laptop, so while menus may vary slightly the process should be very similar regardless of OS. Also, I did this using a local VirtualBox virtual machine, using Bridged networking mode to simulate a remote server. In Zend Studio I had a project created with the Zend Framework Skeleton Application, and created a virtualhost in the virtual environment that mirrored that. NOTE: If the desire is to use a local server the setup is much simpler. While this post doesn’t cover how to install Zend Debugger or Xdebug, ensure one of these are set up correctly. Also, ensure the debugger of choice “knows” where to find the IDE to be debugging from. 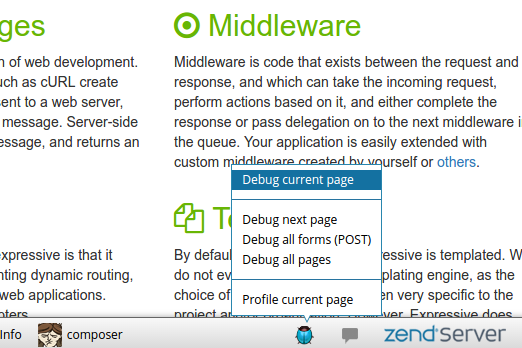 Zend Debugger can try to do this automatically, or an IP can be manually specified within Zend Debugger or Xdebug. 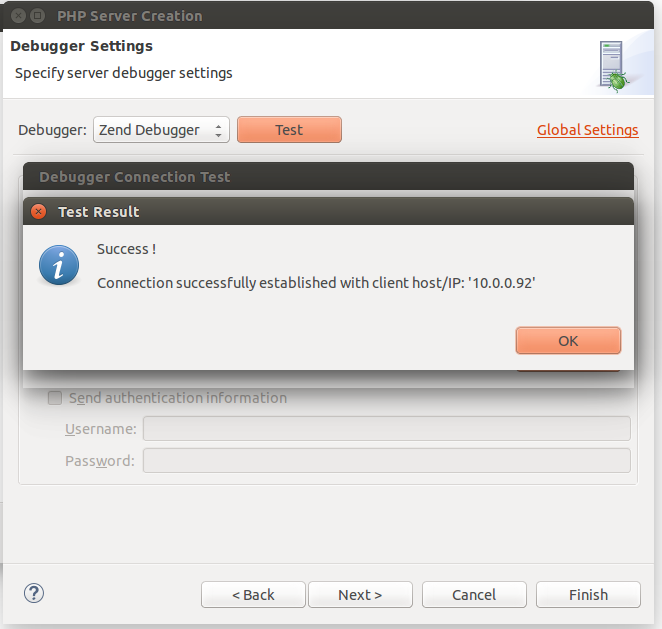 Also, if using Zend Debugger ensure the IP of the client is added to the whitelist. More on how to verify this IP from the client later. 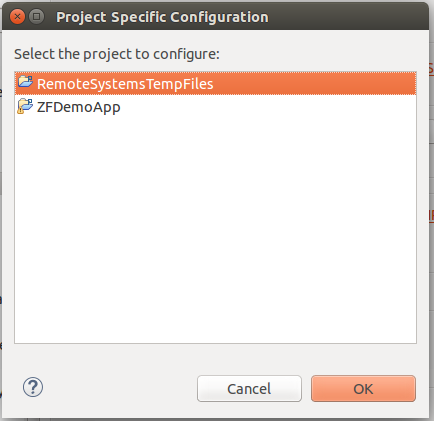 The first step, assuming you already have a project created in Zend Studio, is to add a server to the project configuration. Do this in the preferences. (Windows|Preferences) With the preferences open, expand the PHP node to get to Servers. From there click “New”, and follow the wizard for setup. The first step is to specify the type of server. In my case I was using an install of Zend Debugger that comes with Zend Server, so selected Remote Zend Server. 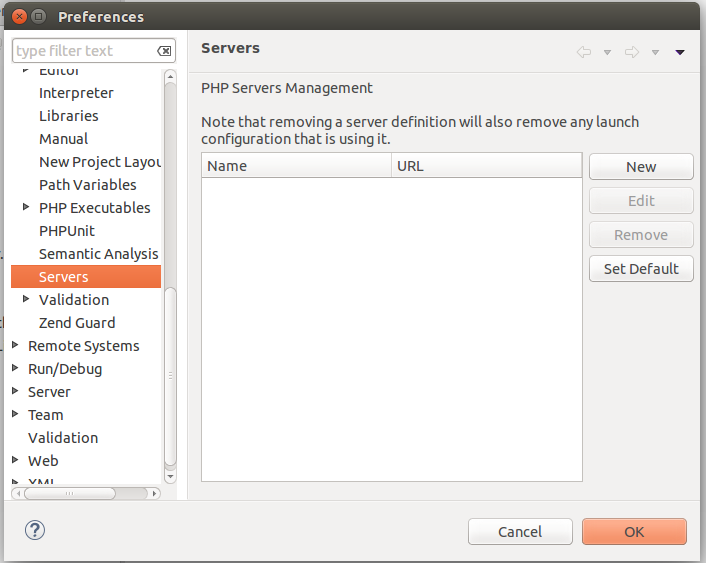 Alternatively I could have easily selected Generic PHP Server to arrive at the same endpoint later. 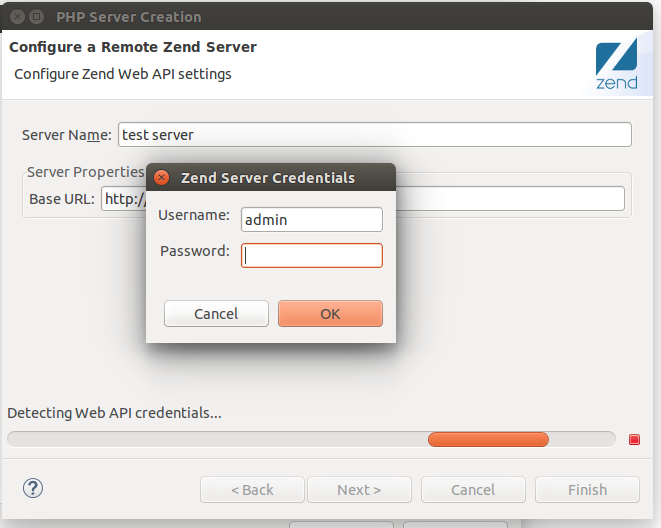 Next, after giving this server a name and URL (ensure the URL actually hits the server), I am prompted for the Zend Server login credentials to gain access to the Zend Server Web API. Entering the user and password authorizes Zend Studio to pull down an API key for interacting directly with Zend Server if I desired to later. 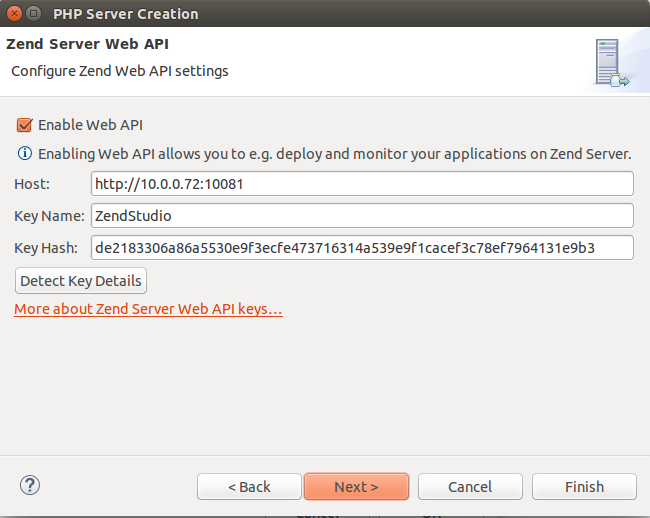 (This creates a new Zend Server Web API Key on the server specifically for this client.) Alternatively it is possible to click Cancel and enter the credentials manually. Again, this is not really required for simply debugging, but I’m including it for completeness sake. At this point a test can be run to ensure we are hitting the server as expected by clicking the Test button. NOTE: If this doesn’t end in a success you may have some network issues to overcome. See my post on using an SSH Tunnel if you need to. After a success, click OK and then Finish the wizard. If you had troubles, please see my post for using an SSH tunnel. 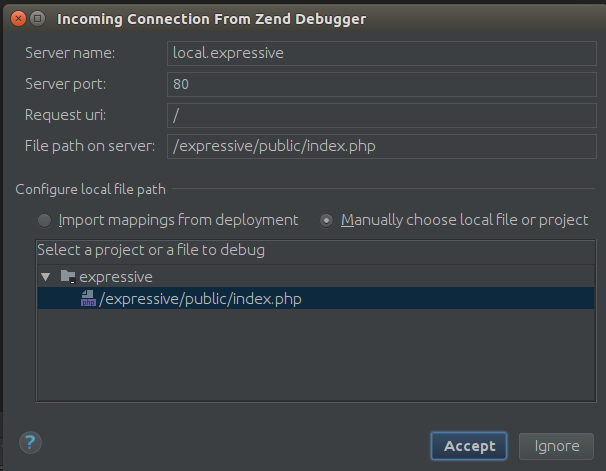 With the server set up it is now possible to set up debugging for the Zend Studio project. 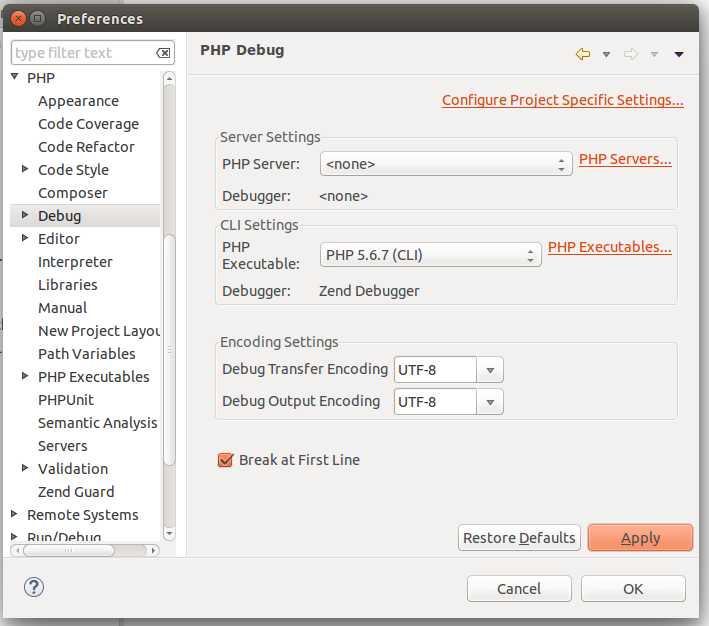 In the Preferences (Windows|Preferences) click on the Debug within the PHP node. Though it is possible to specify the PHP Server globally from the resulting option screen I prefer to set up preferences for each project, since most of my projects may be different in any way. So I click Configure Project Specific Settings… link at the top of the dialog and am prompted to specify which project I desire to configure. After selecting the appropriate project I can then appoint the server I just added above, and then specify the Base Path and ensure the Auto-generated Base URL is correct in the lower section. After approving and closing the Preferences, we are ready to debug!!! Test: If the following step doesn’t work it may be because the debugger on the server cannot find the IDE. In a browser check what ports the IDE is listening on by entering the following URL to hit Zend Studio’s built in web server. If the debug_host doesn’t show an IP address reachable by the server then it may be necessary to manually specify the IP in Zend Studio by altering the server configuration we created previously. If the IP address should be reachable by the server the issue may be in the configuration on the servers end, or perhaps a firewall or load balancer in between is limiting. Please see my post on how to get around this with an SSH tunnel. 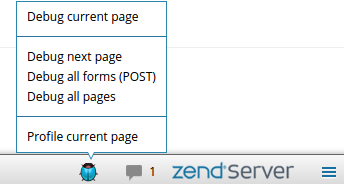 Since I was using Zend Server in this example I have Z-Ray available, and while on a page I wished to debug I could simply click on the debug icon and select any of the debugging options. This will cause Zend Debugger to contact Zend Studio for debugging, which in turn will ask the user if they wish to open the debugging perspective. 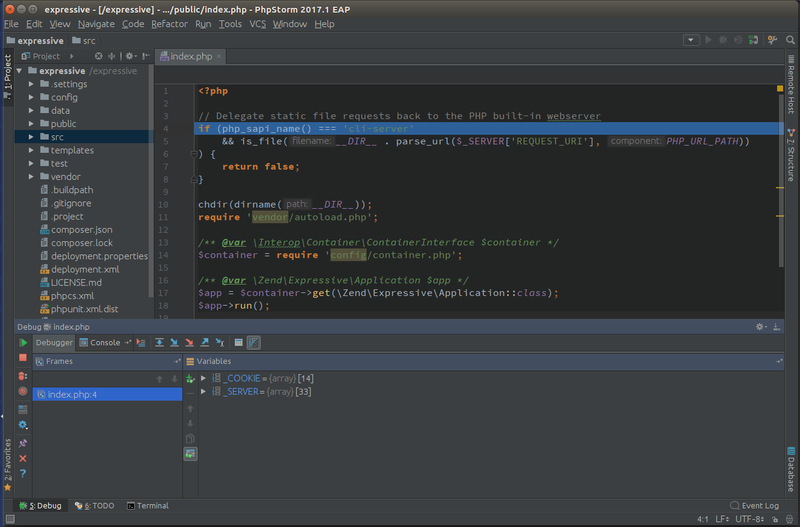 If Yes is selected the IDE is now ready to perform any debugging the user desires. I hope this helps others. Happy debugging!!! Host ‘127.0.1.1’ is not allowed to open debug sessions – please configure zend_debugger.allow_hosts in the ini file.Failed to connect to host ‘127.0.0.1’, reason: ‘Connection refused’. The person experiencing this issue was attempting to debug a site in a VirtualBox virtual machine from the host machine. Both the host machine and the virtual machine were running Ubuntu 14.04. At first glance I thought adding 127.0.1.1 to the allowed hosts would do it. But turns out it was more than that. In this case we knew there was not a firewall blocking access, so it had to be networking. So it appears PhpStorm was attempting to use the IP addresses linked to the host systems ‘localhost’ and ‘hostname’, but not an IP address accessible via the network. This meant the server would never be able to send information back to the IDE without the use of an SSH tunnel, because it could not reach 127.0.1.1 or 127.0.0.1 of the host. 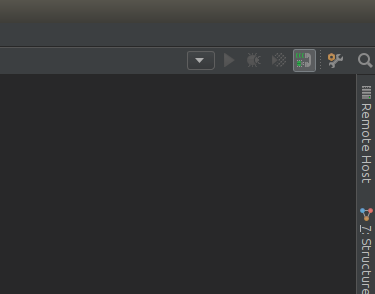 Unfortunately PhpStorm doesn’t provide a way to alter the listening IP addresses in the preferences, so we were left with either using an SSH tunnel to allow port forwarding of the listening port (10137) back to the host, or manually informing Zend Debugger where the IDE would be located. NOTE: Checking the box “Use browser’s IP Address” did not fix the issue. The IP address needed to be entered. With this done, the server now knew where to reach the IDE for debugging sessions. One downside to this is if the host machines IP address changes, this setting will need to be updated.